Etsy SEO for tshirt sellers may be a little different than it is in other places. 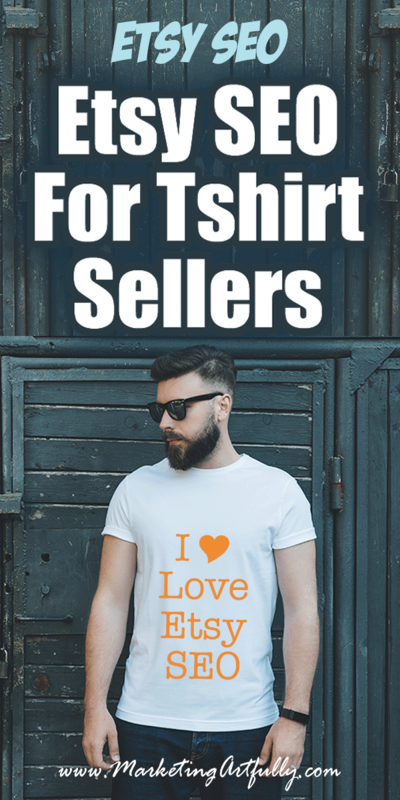 If you are used to selling on pure tee shirt sites you might not be aware of all the nuances you can use with Etsy! 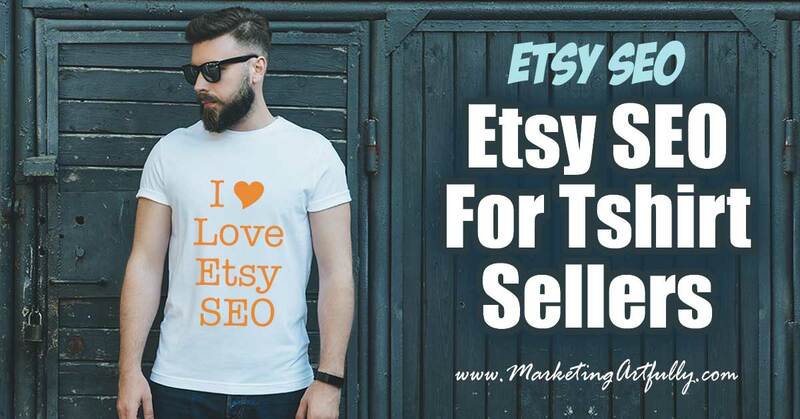 Here are my best tips and ideas for rocking your Etsy SEO! The second area is the tags. You can enter up to 13 tags of 20 characters each. This will come into play a lot later as we find LOTS of keywords we can use in our tags. I know it says that these are optional, but if you don’t use them your chances of getting found in Etsy search go way down! Etsy’s search functionality has gotten better in the last few years that I have been following along, but it is not intuitive. It can extrapolate tshirt to the plural, but will rank them slightly differently. AND it can’t extrapolate kinds of things at all so if you type “collie” it can’t understand that this means dog in the same way Google search can. Please note, the first 4 results are paid promoted listings which we will not being including in our analysis today! You can see the difference in the plurals clearly here. The first search is for “boy tshirts” and the second is “boys tshirt” with the plurals reversed. There are only two that made the search for each of these terms and they are not listed in the same order. 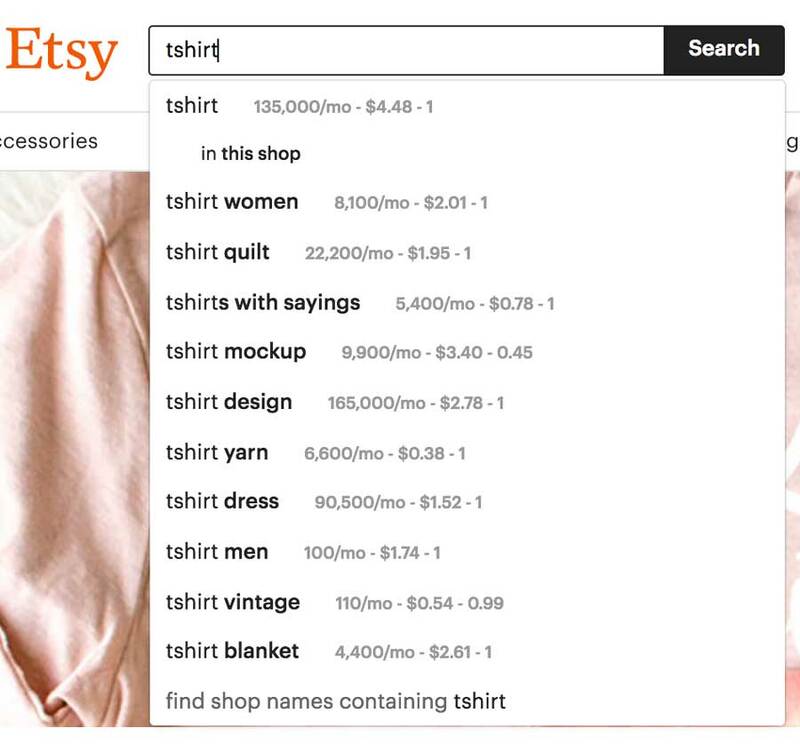 While that may seem shocking, what is even more starkly recognizable is that Etsy doesn’t even count all the “tshirt” synonyms the same. 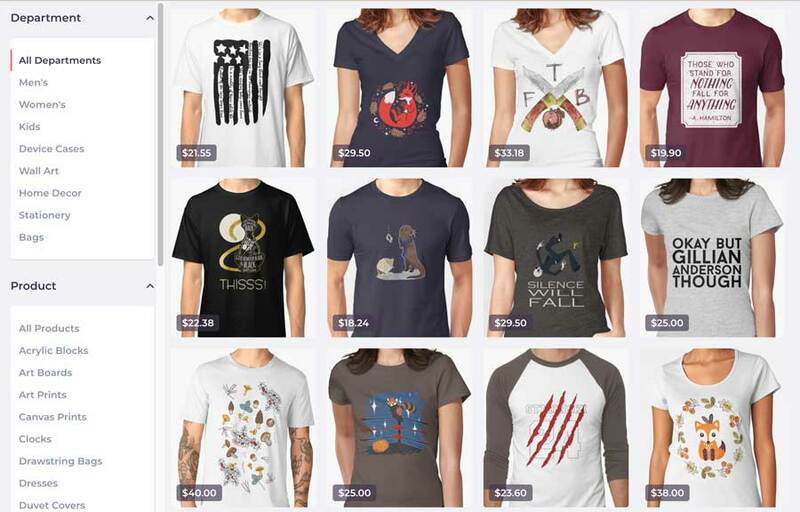 The left search is for “boys tshirts” and the second for “boys tee shirts”. What Does That Mean? You should be using the synonyms for kinds of tshirts in your tags at the very least! I always like to start my research into keywords on Google. Doing a search for tshirts we see immediately that Google asks do we mean t shirts (with a space), let’s note that down for later! I use a Chrome plugin called Keywords Everywhere that spits out a list of related keywords ranked top to bottom with search volume from Google Adwords. Using this we find more keywords! YAY! And now we head back into English class and start to categorize them a wee bit. Dang, just doing that one little search we find that there are a bunch of keywords we could use on shirts in general, but I always find it helpful to do an ACTUAL search to make it more easily understood! 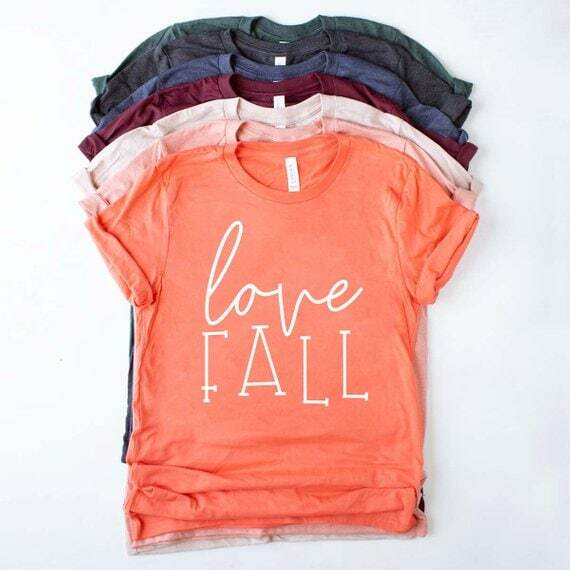 Melissa Montgomery of Overtype graciously said that I could use one of her Fall tshirts as an example in this post. Here is the one we are going to SEO for! What I love about this is that we are not trying to sell something that is “popular” per se (like Disney or geek tshirts). This is just a nice little, seasonally appropriate tshirt! Tags show up at the bottom of the listing and are not really visible to the buyer unless she looks all the way down there. One thing to note is that Melissa has repeated some of the keywords like Fall (3 times), Tshirt (2 times), Women (2 Times) and Shirt (2 Times). You don’t get any added bonus from Etsy for repeating keywords so we will just X those out for now! She also did not max out the words available in the tags. That said, her product photography is brilliant and the design of the shirt is wicked cool! Which Is The Most Popular Kind of Tshirts? Interesting, it looks like t (space) shirt gets the most searches a month, but that could be because it contains shirt although tee shirt didn’t benefit from that so we are going to make sure to use both of those terms in the title and make sure to get the rest of them into the tags! So our title looks like “Love Fall Tshirt, T Shirt” right now. Let’s look for some more good keywords! Now we need to think about what the synonyms and related words are for fall! 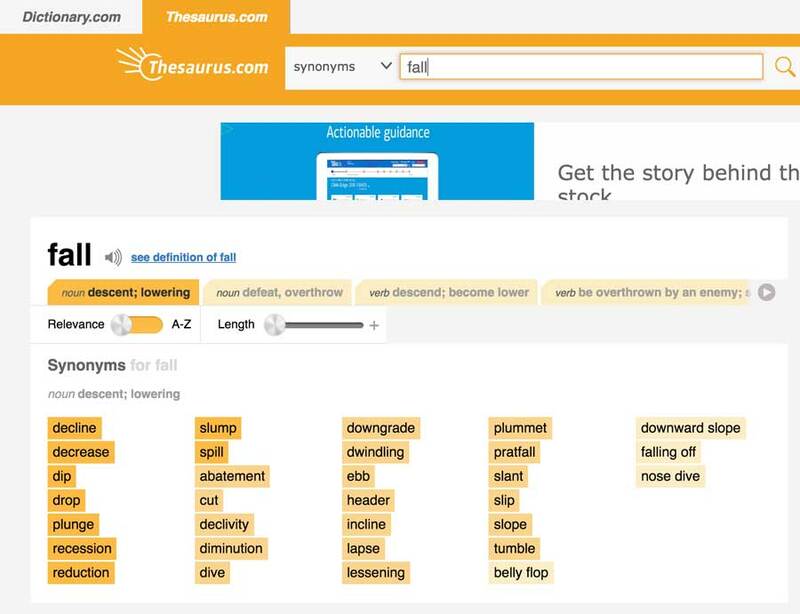 I like to use Thesaurus.com for this! Doing that search didn’t get me anything exciting but I did add it to my title. Advanced: There is a huge question about whether colors shown in “attributes” when you load your listing count towards SEO and I fall on the side of “no” and additionally Google can’t see Etsy attributes so I want that color up there in the title when possible. I KNOW that sometimes means making more than one listing, but in my perfect world I would like to have it there! Are there any that stand out as being appropriate? I like a few and added them to our title! Let’s look at who this is for, a woman! So is it woman, womens, women? Bloody hell, let’s check! The engagement number shows how many clicks are made after the search is done so for sure we are picking “women”. 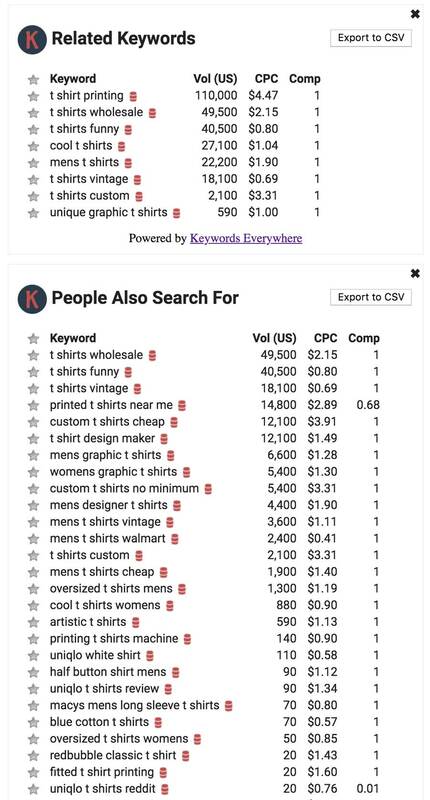 If you are using Marmalead and doing this for your business it would pay to do all the other combinations of searches (women t shirt, womans tee shirt) and make a little chart for yourself about those variations and their search volumes! At this point we still have 49 characters left in our title so let’s check out Pinterest and see what it has to say! I like to check out Etsy last because if I just do what all the other sellers do I will probably not be super creative and successful. We get SO MANY words that no one ever thinks to use, but that at least some people search for! Okay, we see some that we recognize… “tshirt women” and “with sayings”… interesting. Sayings came up twice, once in Pinterest and now here. BUT remember that Etsy cannot extrapolate so we need to add the whole phrase, “with sayings”, to our tags at the very least! 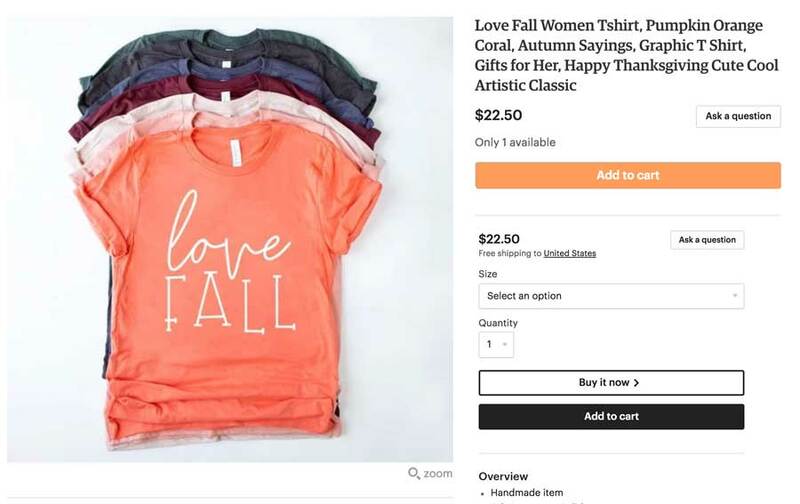 Oh interesting… it is NOT “fall tshirts” it is fall shirts or “fall shirt women”. These are pretty powerful phrases according to Etsy so we will put them in our tags complete like that! Fun! We see that we are on the right track according to the little boxes with our “fall shirts women” and “fall shirts for women”. 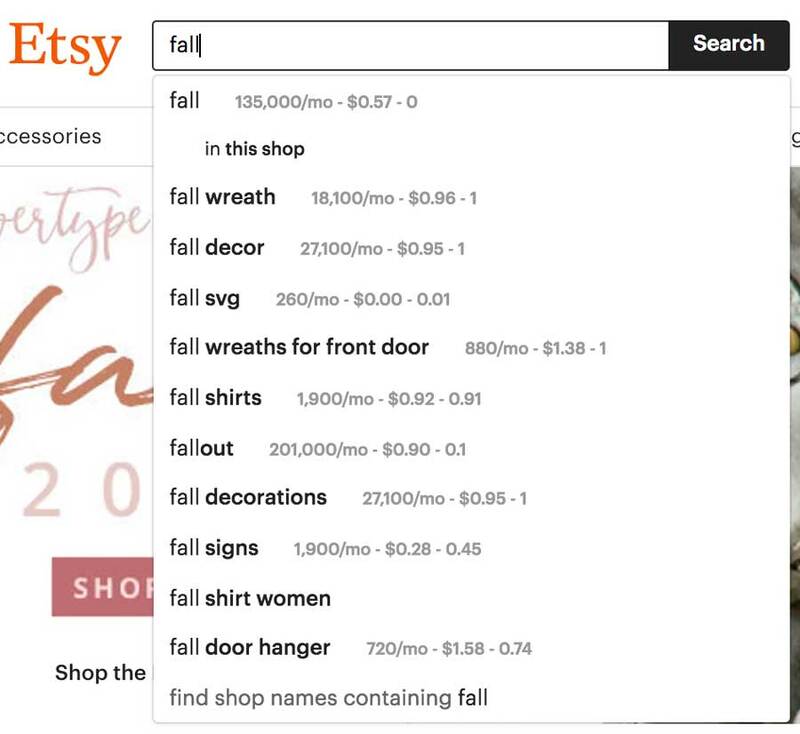 This can sometimes be a really cool place to find Etsy specific keywords! Okay, this super important. Melissa is a successful tshirt seller who has been doing this a while and she knows a thing or two. I am missing some of the words that she originally used in her listing so we are are going to add them in now! Tags can mess up new sellers a bunch. I tend to repeat my title in my tags unless I have a lot of extra keywords! In this case we DO have a bunch of extra keywords so I will just put our main keywords in there and then fill in the rest! Some match exactly and some are just ones that I think could be searched in Etsy for these kinds of tshirts. For example, I thought of a Mom who wanted a cute shirt to wear to her son’s football game, and that shirt looks a little “woodland” to me (see below). Also I added the name of the shop to the tags. Etsy’s shop search functionality is horrendous so you want at least some of your listings to have your shop name! I did a search for “Fall Tshirts” on Redbubble, and while there weren’t a lot, there was one down there on the right that caught my eye. That reminded me that “Woodland” is a popular style right now so I added it to Melissa’s tags all sneaky like! You can also check out the tags they are using to get more ideas! Does It Take This Long Every Time You Do A Listing? Nope! 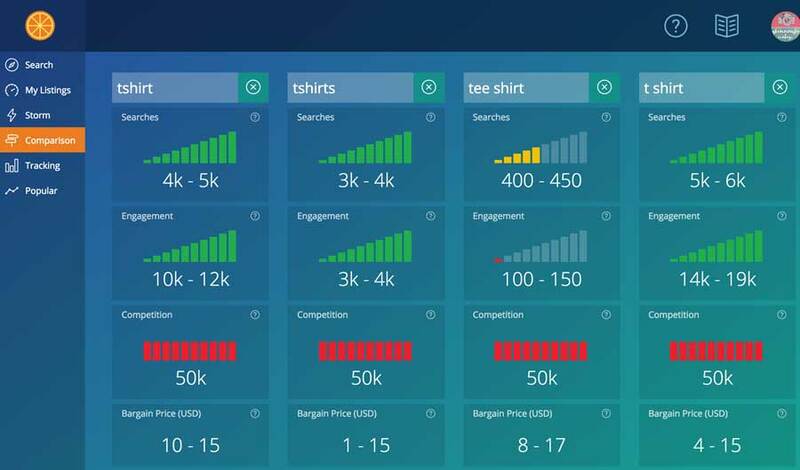 Once you have done this for a while you will have a large list of keywords that you use and that are successful for your shop. You can check out this post about using your Etsy stats to help your overall SEO after you have been on Etsy for a while! Should You Use The Same “Good” Terms In Every Listing? Great question! Nope. While it may seem like you have found some “perfect” keywords to use for your item, if you just copy and paste those over and over again you will functionally be limited to those words in search. Being the first 10 listings for a single search would be great but not everyone searches the same way. Even now 10% of the terms search on Google everyday are brand new and never have been searched before! Make sure to watch the video above to see me do this research “live”!